This recipe is 2 SmartPoints per serving, 1/2 cup. In a small bowl, combine the yogurt and cream cheese. Mix until smooth. Add the buffalo wing sauce and combine. Spray your slow cooker with cooking spray. Add in the chicken breasts, salt and pepper, cheese and buffalo wing sauce mixture. Mix together as best you can. Cook on high for 4 1/2 hours, or until the chicken is cooked. Take the breasts out and shred them. Add the chicken back to the mixture and stir to cover. Let cook for another 30 minutes or more. Serve with the celery sticks (it was like eating chicken wings) or tortilla chips. 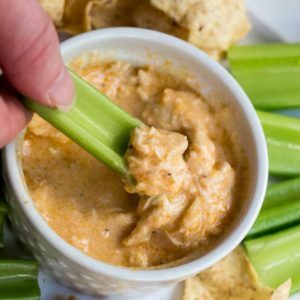 According to the Weight Watchers Recipe Builder, this recipe is 3 SmartPoints per serving, 1 cup of the buffalo chicken dip.